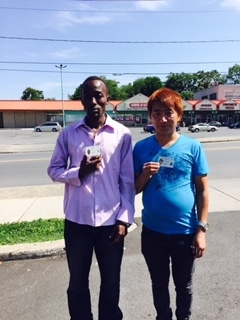 Congratulations to Jagoub , Purna above and two additional riders of our Ride To Work program who began their jobs in May! All four passed their Driver's Permit exam.. Also, a big shout out to Wil , our driver who has been encouraging and mentoring them. One Rider who is from Nepal also has bought a car and is looking for a licensed person who speaks his language to take him riding so he can practice for the driving road test. He is willing to pay if you know someone interested. Our program provides people who need transportation to accept a job the opportunity to get the job and begin working to save for their own car so they can be independent. There are so many others who need this help in Syracuse. Will you help us help other wonderful unemployed people like these guys? For $118 we can cover one person's transportation for a month. For $30 we can transport one person for a week. Whatever you can donate on our website goes to help more people get jobs. Please make a difference in a person's life- help them work.